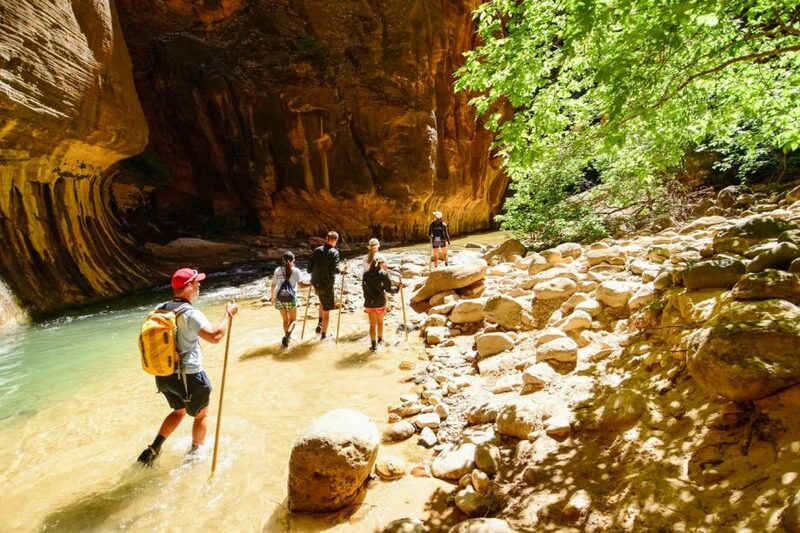 Spend a weekend completely immersed in Zion Canyon on our Zion National Park hiking trip. 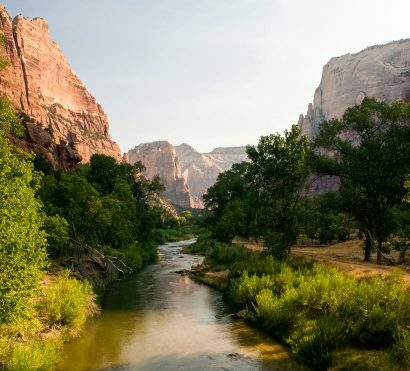 Towering red walls and serene riverbanks excite and inspire visitors to visit and experience the best hikes in Zion. Explore the park’s trails and camping in a Zion National Park campground so you never lose an opportunity to take in the incredible views. During your weekend in Zion, AOA guides will show off all the highlights while sharing their favorite tips, tricks, and insights into the park’s history and landscape. At the end of each adventurous day, the evening is filled with relaxation while your guides prepare delicious fresh meals and make it easy for you to revel in the magic of Zion. 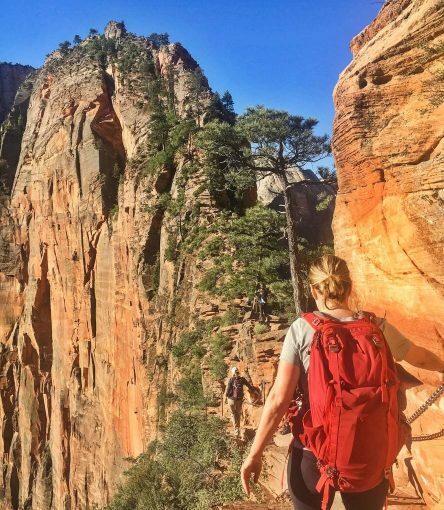 Adventurers of all kinds will find plenty of things to do in Zion National Park on this 3-day trip; guides will lead you to see the Emerald Pools, delve into the Zion Narrows hike, summit iconic Angel’s Landing, conquer the challenge of Observation Point. Optional upgrades, additions, and rentals subject to tax (6.05%). 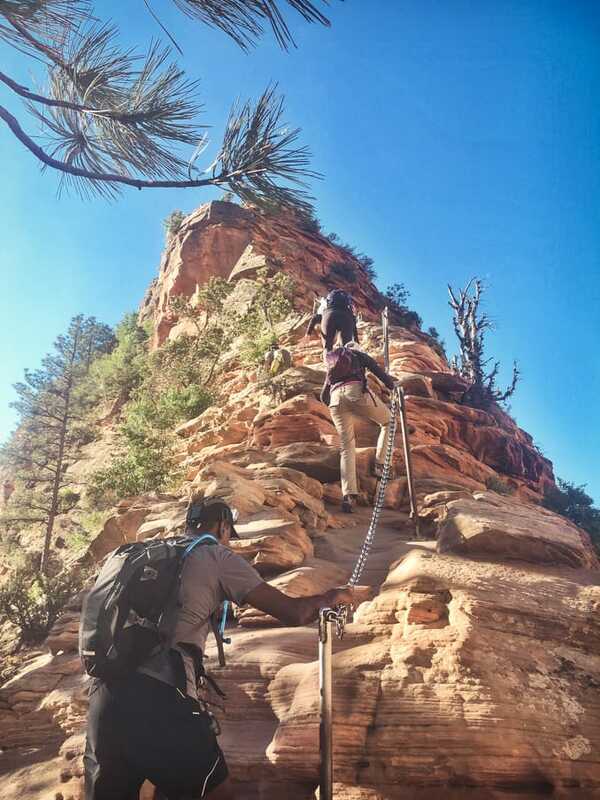 This 3-day weekend adventure with expert AOA guides is the perfect Zion National Park hiking trip to help you get to know Zion Canyon. Your guides will lead you to Emerald Pools and through the Virgin River within the lofty walls of the Narrows, where we learn about the natural forces that carved the canyon’s incredible depths. We will hike Angel’s Landing, whose spectacular vistas were thought by early settlers to be reserved for the flight of angels alone. Together we’ll conquer the challenging Observation Point trail which is one of (if not the best) spot to take in the beauty and grandeur of Zion. At each adventurous day’s end, you and your fellow hikers will have fun sharing your favorite moments of the day while reminiscing on the amazing views. When you return home to your day to day life, you will bring with not only photos of one of the Southwest’s grandest destinations but also the incredible memories of hikes accomplished and new friends made on the trail. 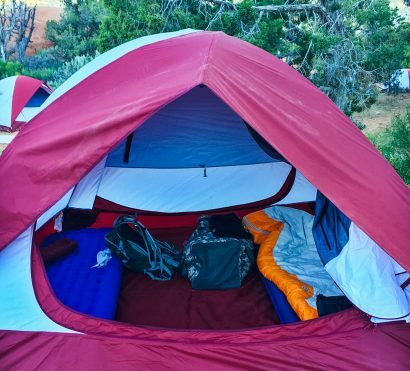 Don’t worry about finding camping or hotels near Zion National Park, we have that taken care of with special sites in one of the Zion campgrounds. This trip takes care of all the details so all you have to do is enjoy your vacation in Zion. Trip Start: Meets at Zion National Park visitor center at 11:00 am on day 1. Trip End: Finishes at Zion Visitor’s Center between 1-3:00 pm on day 3. 11:00am – Meet your AOA Guide and fellow travelers at the Zion National Park Visitor’s Center. We’ll do a quick orientation then hop on the shuttle. We’ll enjoy a quick lunch together then begin with the first of our Zion hikes, the Emerald Pools Trail. This trail meanders past a stream that leads to a series of three pools known as Lower, Middle, and Upper Emerald Pools. After exploring this hidden desert oasis, we can get additional miles in by hiking the shoulders of the Watchman spire to a stunning lookout over Zion Canyon. The afternoon sun splashes the walls in crimson red as we take in the sights and sounds of the valley for the first time. The evening will close with a delicious dinner before retiring to our tents. Today we’ll checkout one of the best hikes in Zion and most scenic viewpoints in the entire park, Observation Point. The maintained trail zigzags its way up the steep mountainside alongside towering cliffs of Navajo Sandstone. before venturing through Echo Canyon, a deep gorge filled with water-gnawed sandstone pockets. Beyond Echo Canyon, the walls drop sharply, giving way to spectacular views. 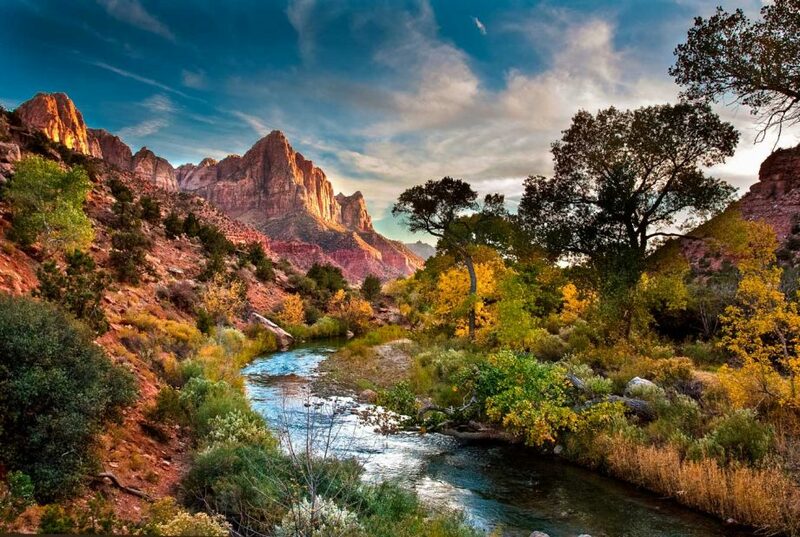 The Virgin River forms a lush river valley below, where water skirts around Angels Landing and the Organ, forming Big Bend. We’ll take a breather at the top to enjoy the view before descending back to the valley floor where we’ll hop on the park shuttle to head to our next adventure, the world-famous Narrows. 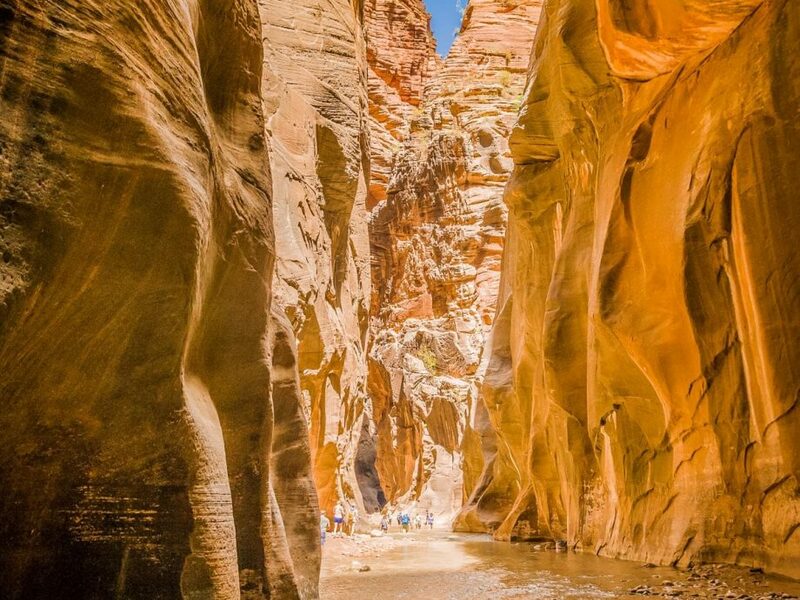 The Narrows are a National Park classic because of the stunning beauty and uniqueness of the terrain. On this hike, we will wade through the knee- to waist-deep water of the Virgin River while 2,000-foot Navajo Sandstone towers overhead on either side of us. Tonight, we celebrate our weekend of adventure and relaxation with a final dinner. On our last day together, we will conquer the challenging hike to Angel’s Landing before the desert sun peaks over the canyon wall. Angel’s Landing is not just a hike; it is the pre-eminent trail of Utah’s National Parks and the entire National Park System. Making it the perfect adventurous finale to our fantastic weekend of exploring our national gems. Named by Reverend Frederick Fisher in 1916 when he exclaimed,” Only an angel can land on it”, this hike’s legend has been growing since its opening to the public in 1926. The trail ascends 1,488 feet in 2.5 miles to the 5,790-foot summit of a monolith perched partway between the river and the canyon rim. It is flanked on three sides by the erosive North Fork of the Virgin River below. 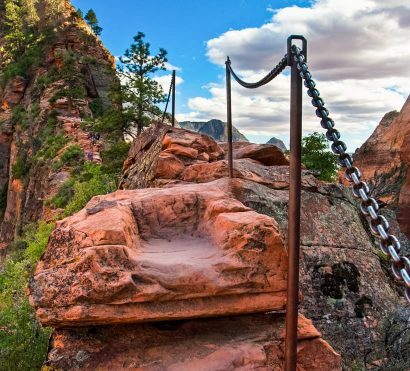 The payoffs to landing on this perch are sweeping north-south views of the Virgin River Gorge, Cathedral Mountain, Observation Point, Cable Mountain and the Great White Throne looming high above Angel’s Landing. After descending back to the canyon floor, we’ll head over to Red Rock Grill for lunch before hopping back on the shuttle and returning to the Visitor’s Center where we’ll say our goodbyes to the towering sandstone peaks of Zion. Electricity: While camping at Zion, you will only have electrical outlets in the public restrooms at the campground. Bring a portable phone charger so you’re not reliant on this power source. Showers: There are hot showers available on this trip, but they require that a walk of about 10 minutes outside the campground. Zion is a beautiful destination, and you’re not the only one who thinks so. On weekends from spring to fall, the park can be very busy and we may have trouble finding parking for our van and experience wait times while waiting for the park shuttle. We always look for opportunities to get the trails to ourselves, but Zion has strict permitting regulations so we will need to stay together as a group when inside the park.